The Holy Grail of cleansers.. used by celebrities, models, MUA and now me. Actually it is pretty awesome. However, let’s be clear – this ain’t some miracle “1 swipe all makeup gone” cleanser… which although tempting to imagine, is utter nonsense. Infact, I don’t find it as effective on my eyes as my Boots Botanics eye makeup remover (the dual phase one) but let’s not forget that Bioderma is working it’s magic without the help of various oils. This stuff is plain Jane. If it didn’t have a label on it announcing the contents – I could easily mistake it for half a litre of Evian. It’s odourless and colourless with a texture just like water. And this is where it’s greatest strength lies, it is incredibly gentle on the delicate eye area and does a good job at removing all sorts of makeup including waterproof mascara. I still cleanse afterwards with water and whatever happens to be “cleanser of the month” sitting by my sink… but this is just so handy to dip a q-tip into to neaten up your eyemakeup or lipline. There’s gonna be someone out there who’s skin is sensitive to this stuff… but I’d be happy to bet they’re few and far between. After cleansing, my skin feels clean, non-tacky, non-oily and surprisingly soothed and moisturised. If I ever go camping or backpacking (heaven forbid) I’d make sure this was safely packed before I’d even think about packing knickers. 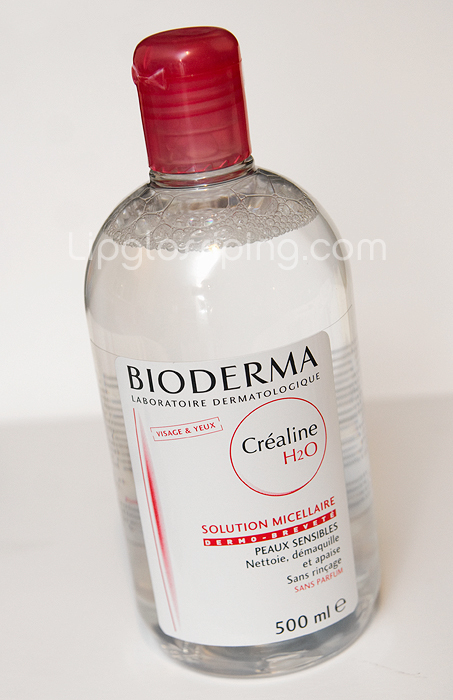 Bioderma have recently rebranded this from “Crealine” to “Sensibio” so if you’re after a bottle, make sure you look out for either name – they’re the same product. How does it feel on the skin? Is it greasy? Oh, I thought they rebranded it the other way round – from Sensibio to Crealine 😉 I’ve used Sensibio for a time now but last time I was in France I hesitated, because the bottles looked the same only the name was Crealine. Interesting, isn’t it? Foundation. What I want... what I really, really, want. Help Help! I have triangle hair! Liberty stamp the seal of approval on their own brand of bodycare!